If you're a regular here, you've probably heard me babbling about some new vintage and retro for some time now. It has in fact been a bit of a passion of late, going back to the past decades for inspiration for my outfits. One of my favorite things for some refined elegance and a touch of the golden decades is definitely Ancient Madder silk. 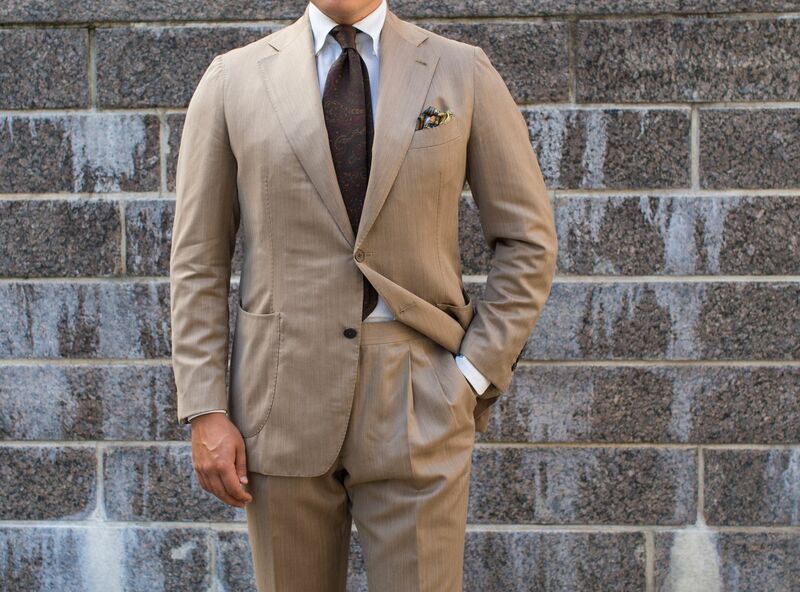 This wonderful fabric has a somewhat distinct feel and look to it, one that tends to also vary quite a bit between different manufacturers. 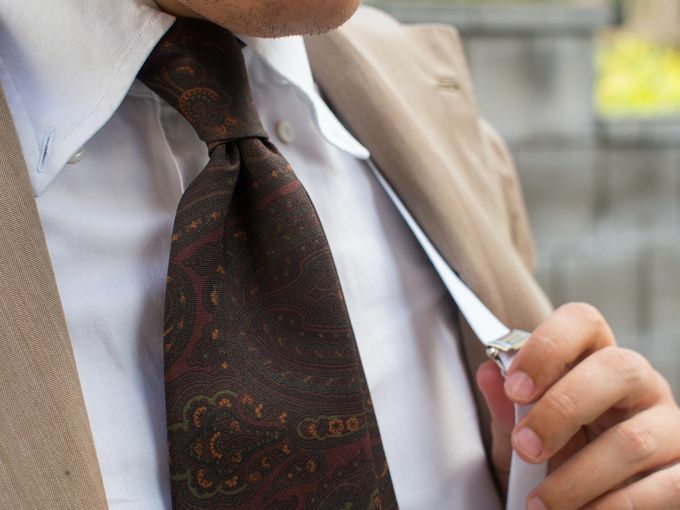 My collection mostly includes ties from E&G Cappelli, Berg & Berg and Drake's London, but there are several other makers that have some gorgeous designs available most of the time. In addition to these, I'd definitely recommend checking out Shibumi, Viola MIlano and Exquisite Trimmings as well. Today's pictures show a pretty good example of catching that late August feel in my opinion. The weather is still warm, but you start noticing those early signs of autumn that is waiting just behind the door. 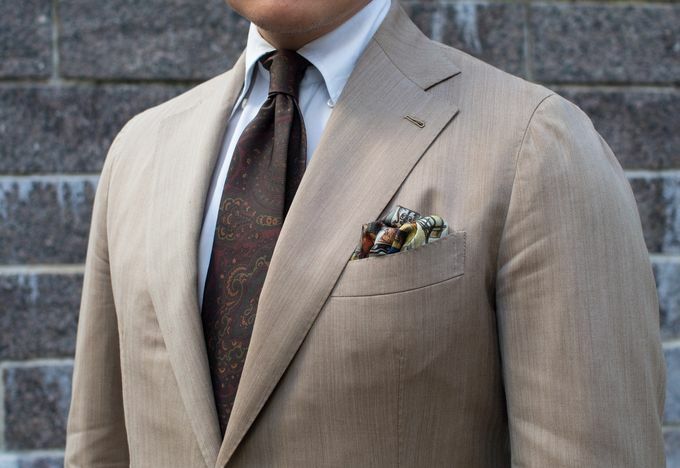 I personally like to adapt to this kind of a weather and time of the year by going for "dry" and somewhat darker accessories. I also like to start wearing socks somewhere during August, even though the weather would still be very warm. 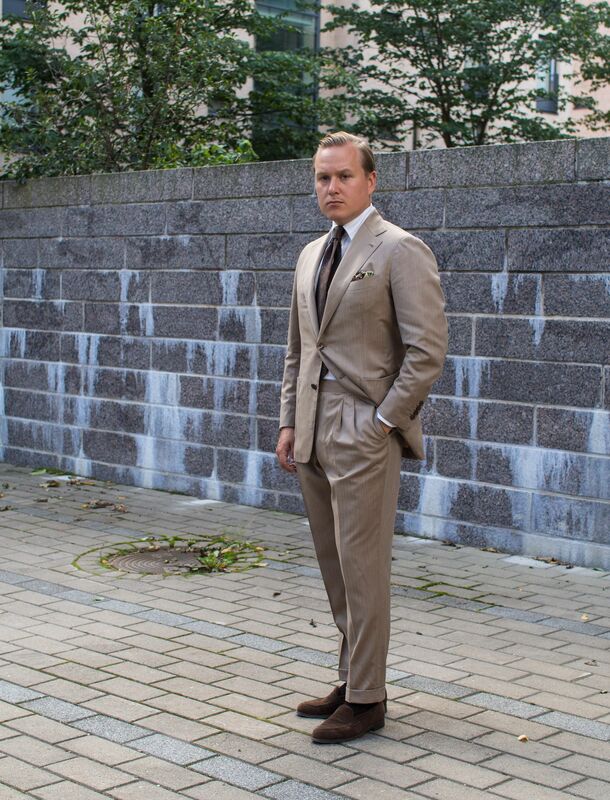 The worn items here include a handmade mtm suit by Vaatturiliike Sauma, button-down shirt by Berg & Berg, Ancient Madder tie by E&G Cappelli, silk print pocket square by Rampley & Co, braces by Drake's London, socks by Mazarin and loafers by Septieme Largeur. The beige Solaro suit is transformed into a proper late summer piece by sticking to a plain white shirt and darker accessories with deeper and more dramatic colors. 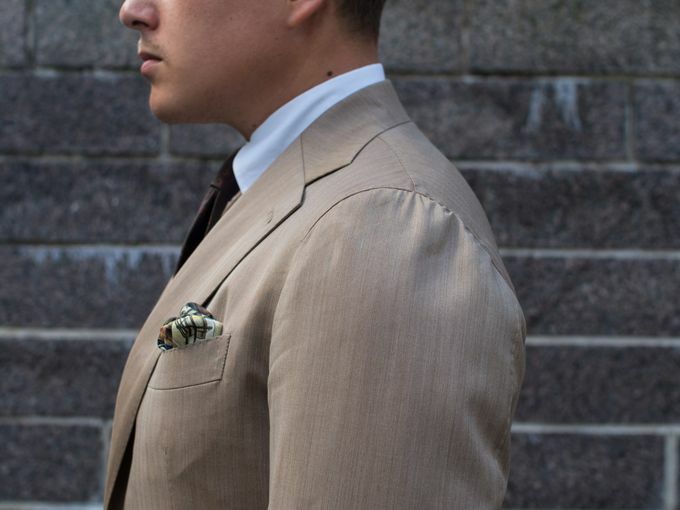 Handmade shoulder that infuses the suit jacket with some life and classic elegance. 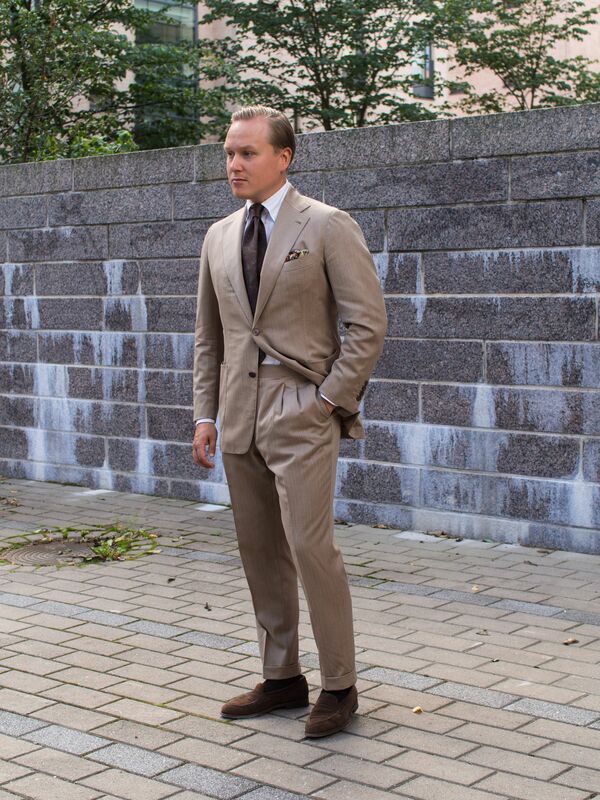 The dark burgundy, olive and tan colors in the tie create a seasonal palette with Rampley & Co's The Annunciation pocket square. 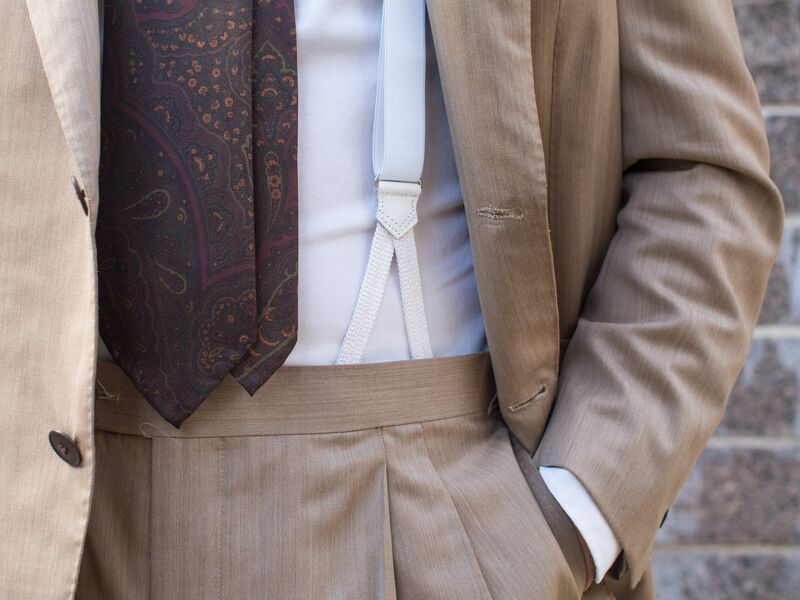 White narrow braces from Drake's London give the look some understated elegance. These braces are, in my opinion, probably the most versatile accessory one could have. They're easily used with almost every outfit from a casual sport coat look to an evening tuxedo. I will be writing a separate "analysis" on these in the upcoming weeks. 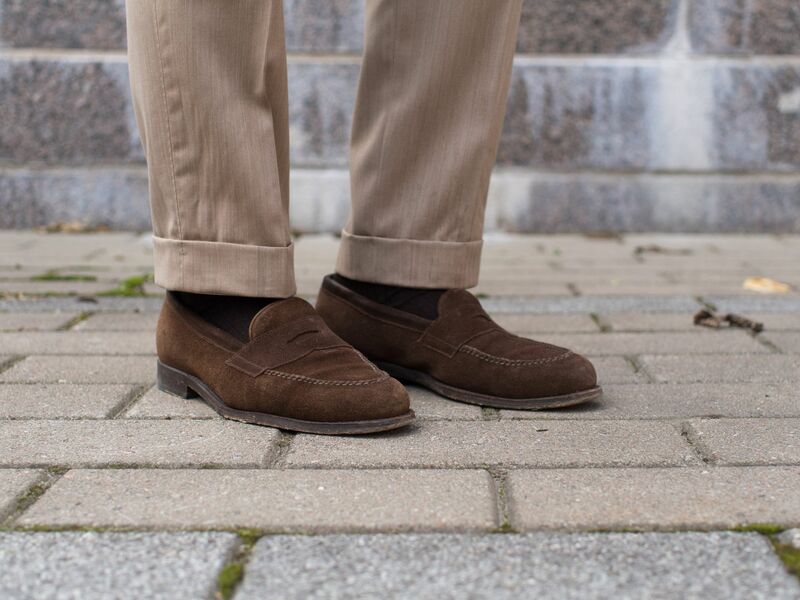 Lastly, the dry texture and the darkish brown color of the Septieme Largeur penny loafers follows along with the understated approach. The dark brown lightweight wool socks signal the changing season.